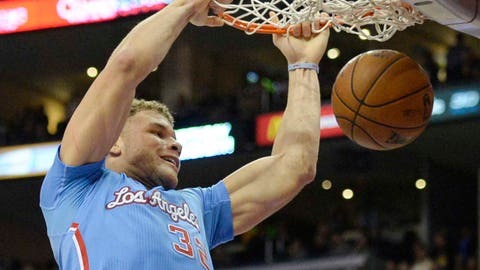 Los Angeles Clippers power forward Blake Griffin dunks against the Timberwolves at Staples Center. Blake Griffin was named the NBA’s Western Conference player of the week for the second time this season after averaging 26 points, 11.3 boards and 3.3 assists in the week ending on Sunday. Griffin shot 49 percent from the field and went 35 of 40 (49 percent) at the free-throw line as the Clippers went 4-0 on their homestand. Griffin, who leads the team in scoring with 20.9 points per game and is second with 10.5 rebounds and 3.1 assists, also nabbed the award in early November.